Petrofin Research issued its latest annual survey on the course of the Greek-controlled shipping fleet and the companies involved. Among the main conclusions are the fleet tonnage has kept on expanding, despite the fact that fewer companies are running all those ships. Despite a number of new entrants, overall the total number of shipping companies fell by 9 companies. This was the result of a number leaving shipping or merging, leaving in operation 588 companies compared to 597 last year. Although nothing similar to last year’s dramatic drop, the reduction in the numbers of Greek shipping continues for the 7th year running. Greek shipping companies are down by 9 to 588. 25+ vessel fleets are slightly down. 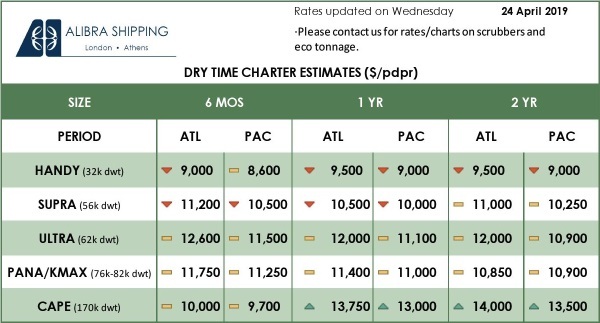 Tonnage wise they are up by 15.6m tons DWT. 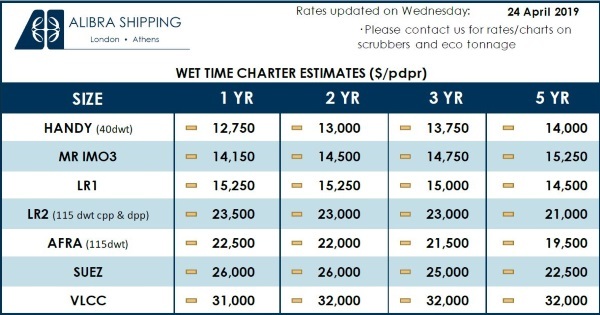 The top category of 25+ vessel fleets aged 0-9 years, however, are down to 168,135,645 tons DWT from DWT 199,833,358 from DWT 188,404,805 in 2016 and DWT 154,332,959 in 2015. The companies that run them are now 23 compared to 31 in 2017, 30 in 2016, 24 in 2015, 22 in 2014 and to 14 in 2013. An explanation for the above vessels can be found in the slowdown of newbuilding deliveries and some consolidation in the overall number of 25+ company fleets due to sale of older vessels. The overall number of fleets across all age groups is, however, only slightly down whilst their tonnage is up. Over 1m ton owners are now 77 compared to 75 in 2017, 68 in 2016 and they have now reached 80% of the total Greek fleet, compared to 79.58% in 2017, 77.47% in 2016, 76.7% in 2015, 74% in 2014 and 71.33% in 2013. It appears that for the time being, the 80% share of the ton millionaires may not be easily breached, as it represents a significant level. Overage fleets of 20 years+ are down to 198 from 200 in 2017, 235 in 2016. Interestingly, the companies running very young fleets (0-9 years of age) are 12 less down to 172 from 184 in 2017, 187 in 2016 reflecting the relatively fewer newbuildings and the small increase in the average age of this segment. Smaller companies (with 1-2 vessel fleets) are down to 218 from 233 in 2017 and 265 in 2016. The level of consolidation, especially among the smaller companies, continues. Another interesting development is the slight rise in age of the total fleet to 12.08 from 11.8 in 2017 and 12.19 years in 2016. As explained above, we note the slowdown of a) newbuilding deliveries and b) acquisition of relatively younger tonnage and c) positive market sentiment. “As the fleet continues to expand it is interesting to observe the distribution of the fleet amongst the different company sizes. Especially this year, we had some noteworthy results as the number of companies operating top fleets (25+ vessels at 0- 9 years of age) are down by 8. As has been the case throughout the 21 years that we have been researching Greek shipping, although at first glance this looks like a decline in Greek shipping because of the fall in company numbers, the fleet itself is still expanding and remains young”, Petrofin said. The overall number of Greek vessels has gone from 5281 to 5508. 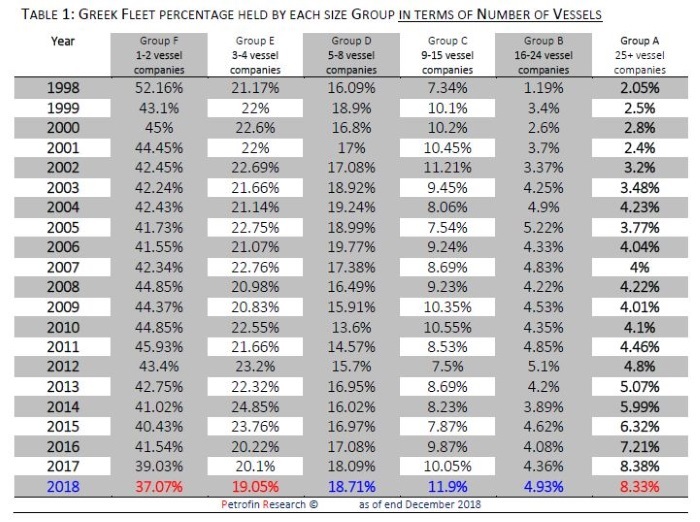 The real increase in the Greek fleet is, of course, in DWT terms. Here the picture is both dramatic and interesting. The total DWT of the entire Greek fleet in 2018 is 412,310,405, compared to 387,256,616 in 2017, 361,934,047 tons DWT in 2016, 328,254,495 in 2015, 303,579,176 in 2014 and 281,467,983 in 2013. This increase by 25 million tons DWT or 6.5% is significant. This growth has come from adding primarily good quality younger second hand tonnage, as well as newbuildings of increasing average vessel size on average. An interesting development is the small rise in age for the average vessel, to 12.08 years of age. Up to 2017, there was a continuous drop in average vessel age: 11.8 years in 2017, 12.19 in 2016, 12.73 in 2015, 13.26 in 2014, 14.05 in 2013 and 14.7 in 2012. In terms of fleet age and using a 20,000 DWT cut-off, the increase in average age is occurring for the second year in a row. It now stands at 9.03 years, compared to 8.6 in 2017 and 8.4 years in 2016. This is despite the vigorous S&P activity but involving fewer newbuilding deliveries. The focus has been the acquisition of quality, young second hand tonnage. The impact of this, plus a slowdown of newbuilding ordering and deliveries, is showing for the first time in the small increase of the average age of the whole of the Greek fleet. The Dry bulk fleet (vessels over 20,000 DWT) gained 192 vessels compared to the 129 vessels added in 2017 and 111 in 2016. The average bulker vessel age has gone up to 8.8 from 8.3 years in 2017. The Dry bulk tonnage is up and has added 15.7m DWT in 2018, compared to an additional 12.7m DWT in 2017 and 7.2m DWT in 2016. This fleet is run by 315 companies compared to 313 in 2017. The large Container fleet (vessels over 20,000 DWT) shows 4 vessels more. We should note that there are now 34 companies operating large containers, which is the highest number since 2013. Although there are slightly more vessels, overall tonnage is down again this year to 23m DWT for the large ones. This reduction is reflected in the average container vessel of over 20,000 down to 62,775 DWT from 64,704. The enlargement of the large Tanker fleet (vessels over 20,000 DWT) continues both in terms of vessel numbers and tonnage. Keeping in line, though, with the overall increase in age, we note that the average tanker vessel now, although bigger, is 9.25 years of age compared to 9.11 last year. Tonnage is now 159m DWT from 149.45 in 2017 and vessels count 1,048, up from 1,004 in 2017. The average tanker vessel is 151,730 DWT compared to 148,850 in 2017. Large LPGs have slowed down and even decreased in numbers, down to 65 from 76 in 2017. Tonnage is down to 2.8m DWT from 3.7m in 2017 and the age is up by a year to 7.7. The LNG fleet shows a different picture, whereby the fleet is now 105 vessel strong from 82 in 2017. Tonnage is up from 7.11m DWT to 8.9m DWT and the companies that operate them are also up from 8 in 2017 to 13 in 2018. In terms of age, the average LNG is now 5.3 years of age compared to 3.75 in 2017. The expansion of the Greek fleet is continuing through vigorous second hand vessel purchasing, with newbuildings still not a priority. In its analysis, Petrofin said that in order for Greek shipping to grow, it requires 3 necessary elements. Firstly, the commitment towards continued shipping investments of an immense size in order to enhance owners’ position, competitiveness and continuous investment in staff and systems. Secondly, shipping markets enjoying or promising sound returns on investment. Thirdly, the necessary finance and equity. It is self-evident that Greek shipping enjoys all three of the above elements. The changing prospects among shipping sectors are addressed by timely and sector investments and diversification, in which Greeks excel. “The finance and capital aspects are more complex. In 2018, only $7.9 billion were raised globally by shipping via the capital markets, in shares and bonds, which is hardly sufficient to support the Greek growth story. This represents approximately 1% of the global shipping fleet value. As per our Petrofin Bank Research ©, traditional bank finance has been either contracting or stable over the last 10 years and as such, cannot be said to provide the stimulus towards investments. What provides the necessary finance balance is the availability of nonbanking finance via leasing, private equity funds and export finance, as well as increased capital committed by owners themselves and numerous investment funds. It should be noted that in Germany, for example, Cerberus is on their way to own over 1,000 vessels, mainly acquired from German banks, which have been clearing their decks from non-performing loans. In Greek shipping, there are no similar examples, save to say that interest in joint investments by funds has grown and these funds now consist of knowledgeable ex shipping bankers and analysts, who also have a keen eye to market opportunities. Private equity funds aim to generate investment returns of over 15% p.a.”, said Petrofin. It concluded that “their investments require such returns, but it is doubtful if shipping can continue to provide them on a sustained basis at all times, as such high cost does increase the required breakeven rate per vessel. This is compounded by an increase in US interest rates. There appears to be a mismatch between the required investment (or finance) returns for vessels acquired by or in conjunction with Private equity funds and what the market may generate. Joint ventures do possess inherent risks of failure, especially in markets that fail, as history has shown. In addition, the higher cost of finance does inherently put shipping at risk. It will be interesting to see how private equity related transactions fare in the future. Short of a market or financial collapse, Greek shipping is expected to continue its growth and penetration across all shipping sectors in the drive towards larger fleet size, diversity and economies of scale”.